It is vital for New Delhi to maintain an independent foreign policy that would serve Indian interests, and not be dragged into Washington’s plans to contain Beijing. 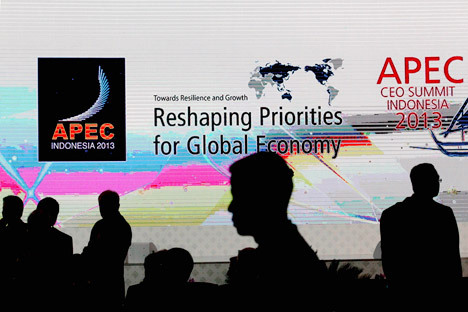 The Asia-Pacific Economic Cooperation (APEC) summit that just concluded on the Indonesian island of Bali was revealing in several ways. For the second year in a row the president of the world's leading economic power, the United States, did not attend the summit. Last year, Barack Obama's absence was due to the upcoming presidential elections, and this time, the unresolved conflict between the executive and legislative branches of the U.S. government, which has resulted in a partial shutdown of government. There is much that could be said regarding this issue. Obama's no-show could be explained by his temporary political difficulties. In the end, the U.S. secretary of state John Kerry attended the summit, and even uncharacteristically eagerly promoted the main brainchild of recent U.S. foreign policy -- the Trans-Pacific Partnership (TPP). And, of course, Obama's absence can certainly not be considered an indication that the United States is turning away from the “strategic pivot” or “return to Asia” policies that then-Secretary of State Hillary Clinton announced two years ago. The impassioned speech by John Kerry in which he defended the TPP (i.e., maintaining the principle that “all countries are equal, but some are more equal than others”), just shows that the United States will continue at various levels to pursue a policy of containing China, its main geopolitical competitor (for now in Asia and the Pacific, but in the long term, world-wide). Suffice to say, China signed 23 economic agreements for a total amount of $33 billion with Indonesia alone. In addition, China's president, Xi Jinping, pledged to nearly triple the volume of Sino-Malaysian trade by 2017, along with setting up a bank to fund infrastructure projects in the region that will boast a budget of $50 billion. But let's return to United States politics. The root of the problem is that Washington’s national debt is growing steadily. In 2012, it exceeded 100 percent of GDP, and at that time rose to $16.394 trillion. It reached that figure by the end of 2012, and if at that time the Republicans and Democrats hadn't drastically reduced public spending, the government was threatened with closure by January of that year. So this is not a one-time event, but an obvious trend. Indeed, if the US monetary system collapsed today, it would bring about a collapse of the world economy, so we have to believe that sooner or later the two branches of government in the United States find a way out of this impasse. But this will not resolve the general trend of growth in government spending, which means Washington will have to explore changes to policies, including foreign policy. What does this mean for the U.S. policy in the Asia-Pacific region? In fact, they have already demonstrated new approaches in other regions -- particularly in the Libyan and Syrian crises. After getting burned on military campaigns in Iraq and Afghanistan, the U.S. is now shifting the burden of conflict resolution to its allies, resorting to proxy confrontation tactics. This allows them to solve problems without overly taxing the financial resources of the USA or risking the lives of American soldiers. This is precisely the tactic the U.S. intends to employ in the Asia-Pacific region. Without involving themselves directly in regional conflicts, they will goad their allies into restraining China so they don't end up bearing the entire financial burden, or possible human losses. Here one might ask: what does India have to do with all this? After all, India still has only observer status in the APEC. But in fact, India is very directly linked. The U.S. is hoping that India will take part in the containment of China. And in some ways, Washington's expectations are justified: India is seriously concerned about Chinese expansion reaching far beyond the Asia-Pacific region, and above all, into the Indian Ocean, where China is actively developing strategic partnerships with India's immediate neighbours, each of which has its own problems of varying intensity with Delhi. But it must be taken into account that, for all the complexities of their relations, China is one of India's largest foreign trade partners. So it turns out that it is possible to develop a constructive partnership even when you are not friends. Is it worth risking all this for the sake of some illusive rewards that may result from blindly following in the wake of U.S. policy? Here it may be helpful to recall recent experience. As the United States increased pressure on Iran, it did everything it could to prevent India from purchasing oil from Iran, who is one of the main oil suppliers to the booming Indian economy. The outcome of all this is well known: succumbing to powerful pressure from the U.S., India experienced a sharp rise in fuel prices on the domestic market, which led to a whole range of problems across its entire economic system. So the big question that faces India as the APEC summit comes to a close is whether it should take sides in what is, by and large, a foreign conflict, or if it would be better off focusing on conducting its own, independent politics that would serve its national interests. The writer is the Head of the Asian Section at the Centre for Asia and the Middle East of the Russian Institute of Strategic Studies.